Disub 302 A-409 is a versatile subwoofer which complements the rest of the loudspeakers with a powerful and deep bass. 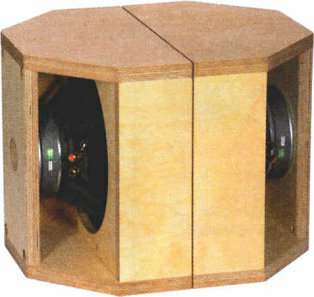 Disub 302 A-409 is a dipole loudspeaker with drivers of Monacor . For the loudspeaker is additionally required: 1 piece of threaded bar M10 x 1000 mm, 8 pieces of counter sunk screw DIN 7991 M10 x 120 mm, 8 pieces of screw socket M10 x 40 mm. The high-end kit is delivered with baked varnish air core coils on important parts of the crossover for minimizing microphonic effects. - The current flow through the coil creates a magnetic field which sets the reel of wire in motion. This motion induces a voltage in the coil which adds itself to the signal. The stiffer the reel of wire is, the less the signal will be altered. The capacitors are of type polypropylen (MKP) Mundorf Evo Öl 350 V.